Group riding lessons available at Talygarn Equestrian Centre Find Out More. With our indoor riding school Talygarn is open is all weathers. Talygarn Equestrian Centre holds regular competitions throughout the year Find Out More. 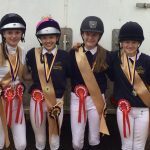 Talygarn Equestrian Centre has the largest and most active Pony Club Centre in Wales Find Out More. Talygarn Equestrian Centre owned and managed by Chris and Steve Rogers is a BHS approved and local authority licensed riding school,British Equestrian Vaulting Centre, Approved Outreach Centre for Equine Training, Riding and Road Safety training and exam centre, Pony Club Centre and Unaffiliated Competition Centre.